The Geodynamic Modelling lab houses equipment capable of simulating Earth processes using analogue modelling. Some of the experiments have been designed to explore complexities in the lithosphere and ultimately continental break-up and ocean initiation, magma and fluid transport through the crust, and volcanic eruptions. Rotational extension experiment. 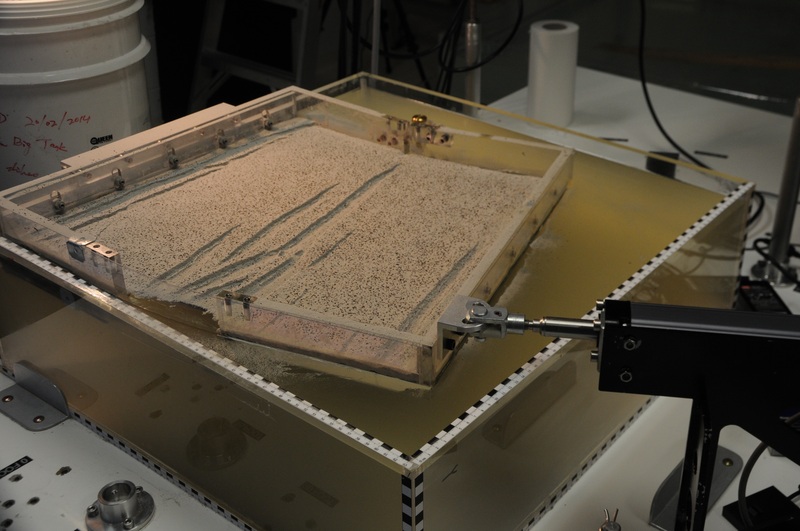 An initially rectangular-shaped, 3-layer model lithosphere is extended from one end of the moving wall with a linear actuator and deformation evolution is tracked by state-of-the-art monitoring equipment. Geodynamic Modelling Lab, experimental set-up. Tanks of various sizes are filled with materials that meet specific characteristics in order to recreate down-scaled physical models of tectonic plates. Different tectonic environments are represented and deformation is monitored by a PIV (Particle Image Velocimetry) system, which provides precise measurements of deformation and dynamic topography.